A part of the eye that is essential for vision has been created in the laboratory from animal stem cells, offering hope to the blind and partially sighted. One day it might be possible to make an eye in a dish, Nature journal reports. The Japanese team used mouse stem cells - immature cells that have the ability to turn into many types of body tissue. 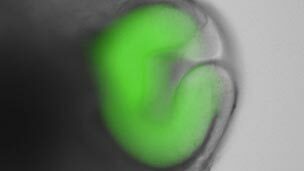 With the right mix of nutrients, the cells changed and began to grow to make a synthetic retina. Ultimately, scientists hope they can use this approach to make endless supplies of retinal cells or indeed whole retinas that can be transplanted into patients with visual impairment. Eventually, it may even be possible to create a whole eye. A US biotech company has already been granted a license to begin human trials of a stem cell treatment for blindness. The retina is the name given to a diverse group of cells that line the inside of the back of eye. Rays of light enter the eye and are focused onto the retina which produces a picture that is then is sent along the optic nerve for the brain to interpret. The eye and the brain together produce the images that we see. Retinal diseases can cause severe vision loss or blindness if left untreated. Retinitis pigmentosa and age-related macular degeneration (AMD) are the most common causes of blindness in old age, and involve the gradual and normally irreversible destruction of retinal cells. In the Japanese study, the cultured stem cells spontaneously organised themselves into a complex structure that resembled the developing embryonic eye. The three-dimensional, layered structure was reminiscent of the optic cup, a two-walled pouch-like structure, which ultimately develops into the inner and outer layers of the retina. The scientists said they were surprised at how well the cells organised themselves with little intervention from them. They said: "Self-formation of fully stratified 3D neural retina tissues heralds the next generation of generative medicine in retinal degeneration therapeutics, and opens up new avenues for the transplantation of artificial retinal tissue sheets, rather than simple cell grafting." Professor James Bainbridge of Moorfields Eye Hospital NHS Foundation Trust said: "Generation of a synthetic retina from embryonic stem cells is a landmark discovery that will help enormously our understanding of blinding eye disease. "It is particularly exciting that this could also provide a source of cells for transplantation." Barbara McLaughlan of the RNIB charity said: "This piece of research contributes to the ongoing efforts to harness stem cell research to benefit patients with a number of eye diseases. "We welcome these efforts particularly where they move from early laboratory research in mice to trials in humans that are an essential part of developing safe and effective treatments."